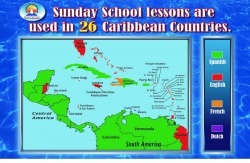 Caribbean Christian Publications products are now distributed to 27 countries in the Caribbean region. These include nearly all the English-speaking countries as well as English-language churches in Spanish, French and Dutch-speaking countries of the region. The largest users are Jamaica, The Bahamas, Belize, Trinidad and San Andres Island (Colombia) and Guyana. 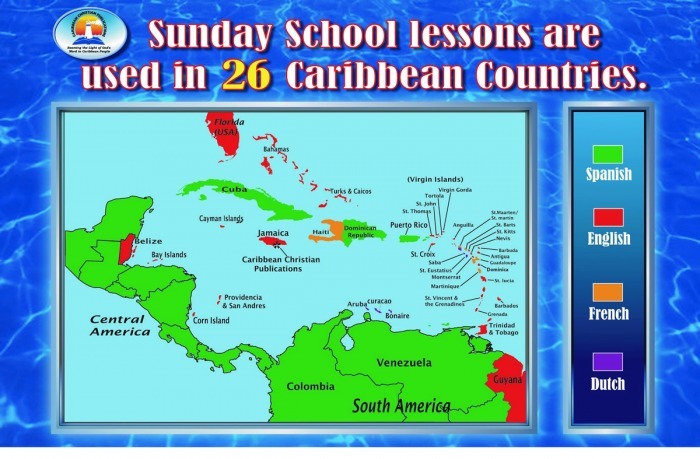 A growing number of non-Baptist, evangelical churches also use Caribbean Bible Lessons. Circulation now exceeds 55,000 pieces per issue. more than sun and sea, calypso and reggae, sugar cane and bananas, insistent street vendors and desperate boat people. More than idyllic little island get-aways fringed with palms and white sand, all seeming very much alike. • An extent of over 1,500 miles from north to south and nearly 2,000 miles from east to west. • About 200,000 Baptists, with the largest concentration in The Bahamas, Haiti, Jamaica, and Cuba.